Sony set the focus not only on OLED. The Sony company Field emission Technologies want to mass produce FED-TVs as soon as possible. 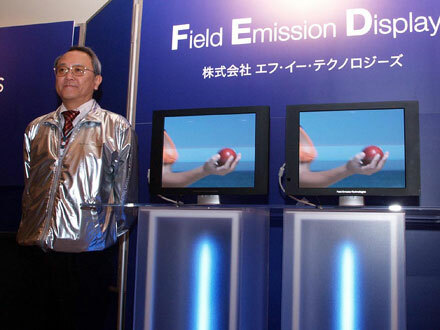 FET is aiming to produce 10,000 26-inch FED panels each year at the plant in Kagoshima. These will be for medical and broadcasting use first, but 60-inch consumer televisions may follow soon after. The nano-Spindt FED (Field Emission Display) is a kind of FED that reproduces images using an array of nanocone emitters to excite phosphors. Taking advantage of highly efficient self-emissive phosphors combined with a line-sequential impulse drive system, this display delivers the visual performance required of a next-generation flat panel display, including a wide viewing angle, lifelike color, outstanding contrast with true black reproduction, and no-blur display of quickly moving images.